The young Hanna Starchyk who comes from Belarus and lives in Germany is one of the 100 passionate activists from Europe and around the globe that firmly believe in the European idea. Right on Facebook, she learnt about an internship opportunity in Social Media Management and applied to become part of the OneEurope team. 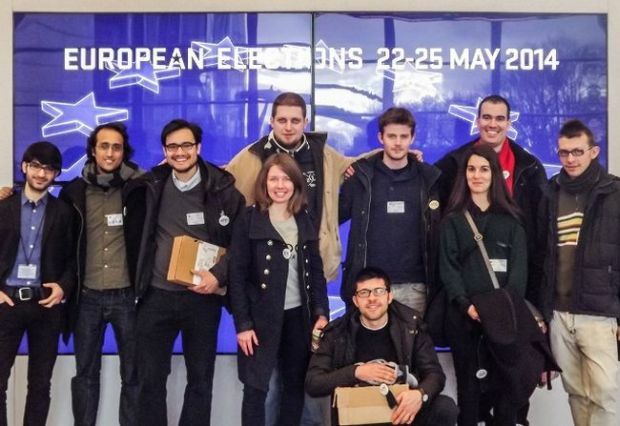 Through the platform OneEurope, young people do not only inform about current European events, but tackle serious issues such as the European identity crisis, youth unemployment, conflicts and quality of education. What makes OneEurope unique from all the other pro-European platforms is exactly the courage to speak aloud about every issue and to empower youth to share their ideas and become active ambassadors, volunteers or occasional writers and regular readers. In the following lines, Hanna is revealing the story behind this grass-root organization. M! : Where did the idea for OneEurope come from? What is your scope of activities? Hanna: OneEurope grew from a Facebook group where young Europeans discussed different European issues. In 2011 Ivan Botoucharov and Cherian Grundmann were particularly inspired by the idea of raising the debate on Europe and noticed a huge potential and interest in this field. They decided to launch a website, because the group in Facebook was not enough for the enthusiasm, ideas and sheer amount of members. The idea was supported by many other passionate Europeans that provided technical help in starting the website. There was also a large number of people willing to contribute to the project as authors and editors. We give Europeans a platform to talk about the issues that are important to them. And they speak out not only for themselves but for their generation. They know that through OneEurope they will be heard. OneEurope’s active presence and strong strategy in social media is one of the key reasons for its popularity: our goal is to provide our audience with information and updates from our website in any social network of their choice. We are glad to say that due to the hard work of our Social Media Managers, OneEurope’s popularity is growing rapidly not only in such social media giants like Facebook, Google+ and Twitter, but also in networks aimed at more specific audience like Pinterest, LinkedIn, StumbleUpon and VK. Apart from articles, videos and images produced by OneEurope’s team, we also share information from our partner organizations about European events, initiatives, campaigns and projects. 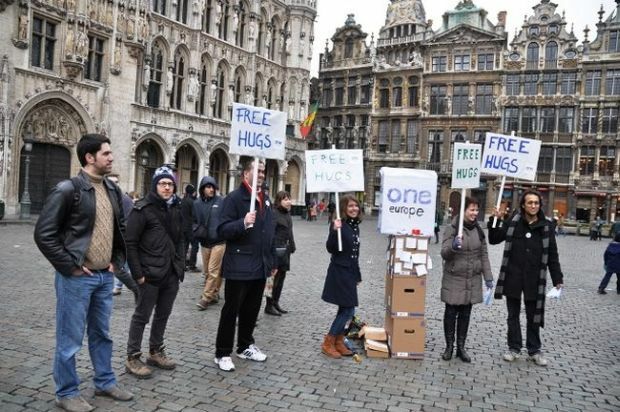 OneEurope also has ambassadors in several European countries, whose role is to represent the project and establish connections with local activists and European initiatives. M! : Being a grass-root organization, how do you organize your work? How difficult is to coordinate your activists? Hanna: Well, as far as the organization of the working process is concerned, OneEurope could be a role model for the European Union itself. Although our activists are spread all around Europe, our well-developed communication network allows us to stay in touch 24 hours a day. Each of the volunteers knows that in case of technical, organizational or any other kind of question or problem they can contact other activists in a number of ways. We use GoogleTalk, Skype, Facebook group chats, thematic groups in Facebook, an on-line collaboration tool called Podio, and of course e-mails and newsletters. In our case the geographical variety is rather an advantage than a drawback: due to the difference of the time zones there are always people online ready to help. Moreover, Ivan and Cherian always keep an eye on what is going on at the website and social media platforms, and when it is necessary help the contributors with a better technical or content solution. They both have a huge experience in this sphere. At the same time, the common interest in the development of OneEurope and in raising awareness of European issues motivates our activists for practically flawless work: they always come up with new ideas and often do more beyond their basic role in the project. It is also the peculiarity of OneEurope that there are no limits for creativity: people learn from each other and try themselves in the spheres they did not dare before. We are very grateful to our outstanding team – people who bring their knowledge, talent, ideas and time to OneEurope. All OneEuropeans have permanent jobs, or are students, and many of them are involved in other projects in their countries and universities. That is why we are especially proud to have such a hardworking and versatile team. M! : On your web-site, you have promoted the concept of crowdfunding. What crowdfunding stands for? Are the people ready to invest and support the idea behind OneEurope? Hanna: Crowdfunding is a great tool for socially oriented, non-profit and independent projects like OneEurope. Every project has the same components: an idea, a starting point for activities, and people passionate about bringing the idea into reality. It happens often that promising and interesting initiatives get stuck halfway and later cease to exist at all because of the lack of financial support. All the projects, without an exception, face this problem one day. Therefore, crowdfunding is a brilliant solution for numerous independent projects to turn their actual support into financial contribution to the project. And indeed people are willing to invest in OneEurope, we gathered a definite amount of donations already, you can see it on our crowdfunding-barometer. The funds gathered through crowdfunding will be spent mostly on the improvement of our web-site, we have some big plans for it. We want to redesign it and make it much more interactive, and we want it to be available in several languages as well. M! : Being an initiative focused on European issues, what is your opinion on the current situation in the Union? What is the role of youth in the struggle against any possible Eurocrisis? Hanna: I personally believe the European Union is very diplomatic, although sometimes it is being criticized for this. The Union bears a huge responsibility by representing 28 countries – its decisions should go along with the interests of all the 28 members. However, the biggest problem of the EU is the slow growth of a European identity in society. Many people still prefer to identify themselves by their nationality and a united Europe is still a very abstract phenomenon for many of them. It should be mentioned that there is also a fear of losing their national identity while adopting a European one. It is especially vivid in the countries which have been oppressed and occupied for a long time. People should understand that their national identity will not be harmed – being European does not deprive them from being Polish, Greek, French or Hungarian. This is exactly the problem – many people think the Union will take it away, not realizing that they are actually the EU. Nonetheless, the youth is the major power of the European Union. We are the Generation of Erasmus, the holders of European identity. Although young people are the most vulnerable group, that is most affected by the Eurocrisis, they are also the major force of solving any crisis with their new way of thinking, education and experience. Ambitious young Europeans will secure the future of Europe, that is why now they need as much support as possible. M! : The general impression is that Europe often is perceived as European Union only. 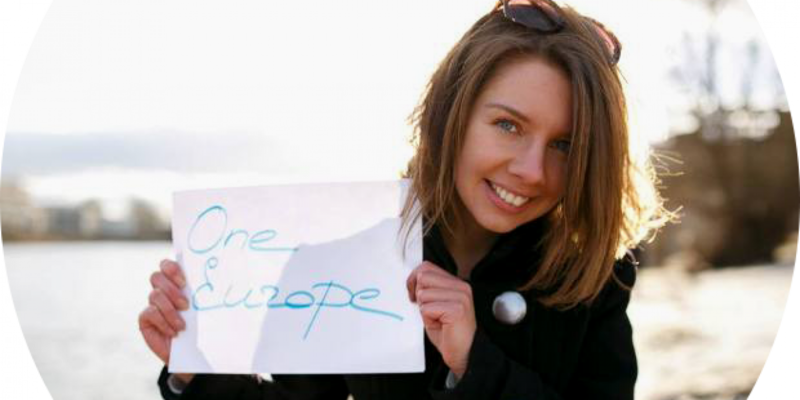 What does OneEurope do to promote all-encompassing European spirit? Hanna: True, OneEurope faces this common misconception very often, and we do everything we can to fight it. For OneEurope it is important to cover European issues outside the EU. Actually the young people in those countries are even more active and ready for debates. We have many volunteers, writers and contributors, and many readers and followers from countries which are not yet in the Union. We pay a lot of attention to the development of the Western Balkans and of former USSR countries – now especially regarding the situation in Ukraine and in Bosnia. As recently as last week OneEurope supported the campaign Free Belarus, for which we wrote a series of articles, analysis and promotional texts. In addition, we are very much interested in South-East Europe. We are looking forward for more activists from Balkan countries to join OneEurope’s team and keep our audience informed on the course of events in this region. M! : What next we can expect from OneEurope? What are your future plans? Hanna: Growth and development definitely are to be expected from OneEurope. As I said before, the plan is to make OneEurope available in several languages and also to launch regional sections. The first step towards it was made a couple of months ago: our teammates from Greece launched OneEurope Greece and now report about European issues in Greek. Our aim is to engage more contributors, and therefore, produce more materials. We currently publish about 10 new articles every week, as well as several videos, infographics and other content. However, we are always aiming for more and more. The thematic variety will widen as well – we will do our best to cover as many aspects of life in Europe as possible. Also we are going to organize more OneEurope events in many European countries. Follow us in order to know where and when the next OneEurope meeting will take place! Then you can meet us in person, ask questions and we can discuss the future of Europe together. In the meantime, join the debate on the future of Europe on our website and social media. Together we can build a better future! Grain bins represent the provide life of a floor. today. When you find your energy bills and orders for materials, contact the home improvement process is quick and guaranteed. likely to hire someone to do it for them when they have more disposable income. cutaways). After creating your videos you should make a blog about it. You – Tube Marketing Suite is without exageration, fake promises or bs. e-books, newspapers, magazines, and other kinds of e-media. If less than a thousand visitors have been shown a particular online ad, then CPM is paid via extrapolation of the data recorded. A campaign can be carried out in a similar manner in the US and the UK, for example. thought-provoking. When searching for traffic exchanges make certainthat the traffic exchange your joining is a well-known, high ranked program. What’s more, these pages become “live” as soon as they are created. Sure, you’re entitled to your opinion, no matter how wrong you are.